Two men arrested by Chicago police earlier this week in the alleged racist attack on "Empire" actor Jussie Smollett were confirmed to be the men on the scene of the alleged incident, captured in surveillance images, a Chicago Police spokesman told ABC News on Saturday. In a statement issued Friday night, Chicago Police Department officials said that "due to new evidence as a result of today's interrogations, the individuals questions by police in the Empire case have now been released without charg[es], and detectives have additional investigative work to complete." The two men were released Friday night and police said they were no longer being classified as suspects. Chicago Police spokesman Anthony Guglielmi told ABC News that the reason "they were there is now central to this investigation and we can't get into that at this time." The release of the two men came hours after police initially told ABC News they were classifying them as potential suspects. They also shut down any reports that there was evidence to classify the alleged attack as a hoax. "While we haven't found any video documenting the alleged attack, there is also no evidence to say that this is a hoax," police added. "The alleged victim is being cooperative at this time and continues to be treated as a victim, not a suspect." Chicago PD had confirmed Thursday that they identified and were questioning the two "persons of interest" in the alleged racial attack. One of them has previously appeared on "Empire," according to a law enforcement official briefed on the investigation. Police say they were tracking the two suspects and were aware of who they were "for a while," and that investigators learned that the two individuals were returning to Chicago on Wednesday from Nigeria. The two suspects are U.S. citizens of Nigerian descent, they added. Detectives also questioned Smollett Thursday, the official said. Attorney Gloria Schmidt, who is representing the two persons of interest, told Chicago CBS station WBBM that her clients were detained at O'Hare Airport Wednesday evening and were unaware of the attack on Smollett. "When they first learned what happened to him, they were horrified," Schmidt said. "This is someone that they know, this is someone that they work with, so they don't want to see somebody go through that. ... They really don’t understand how [police] even got information that linked them to this horrific crime, but they’re not guilty of it." Late last month, Smollett, who portrays a gay musician on Fox's "Empire," told police he was brutally attacked in what authorities are calling a suspected hate crime. He said the attackers put a noose around his neck, poured an unknown substance, likely bleach, on him and used their hands, feet and teeth as weapons in the assault, according to police. Smollett said the attackers also yelled "This is MAGA country" during the attack. He was subsequently hospitalized and released, local authorities said. In his first interview since police say he was attacked last month, the singer and actor said on "Good Morning America" that he was heartbroken when he found out that people questioned the details of his story. "I have to acknowledge the lies, and the hate. And it feels like if I had said it was a Muslim, or a Mexican, or someone black, I feel like the doubters would have supported me much more. 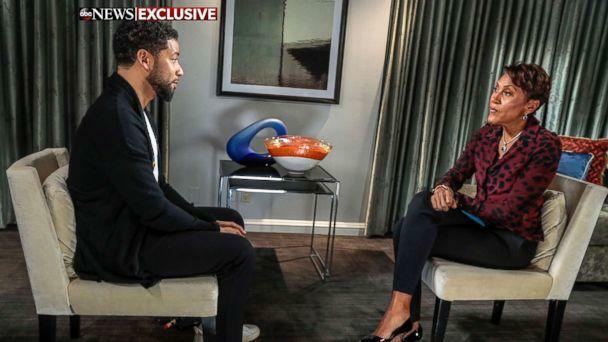 A lot more," Smollett, 36, told ABC News' Robin Roberts. "And that says a lot about the place that we are in our country right now." 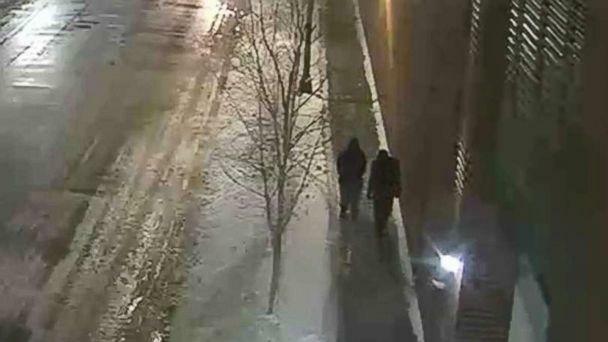 Prior to the police identifying and interviewing the two persons of interest, Smollett said he believes the two men in the photo released by police in the days after the attack are the perpetrators.